TEWANTIN Noosa Bowls Club have rolled out a helping hand for farmers doing it tough. 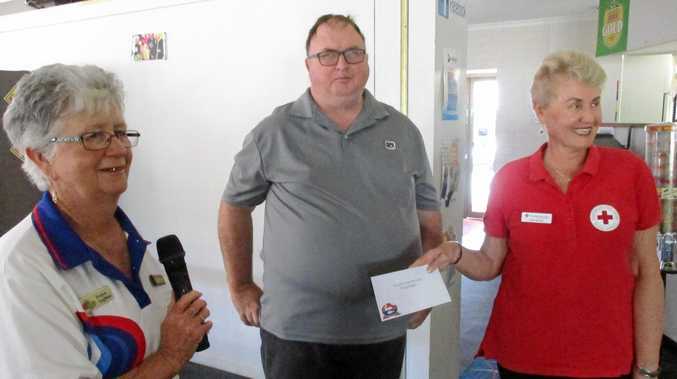 Last Friday, the club invited Red Cross Noosa Branch president Julie Boyer to their tea break to present a cheque for $1000. Public relations co-ordinator Miek Christiaans said it was a great effort by all. "All those Wrong Bias Bowls have really done some good,” she said. The money from their Wrong Bias box along with extra donations from members made up the sum. "Everybody wanted to help,” Ms Christiaans said. Ladies and Men's Bowls Committee presidents Evelyn Coghlan and Heath Costello presented the cheque on behalf of the club. Across August, the Red Cross Help Aussie Farmers Appeal raised $10.5million. Money raised is already making its way to farming communities as grants up to $3000.